"Chutneypudi" as it is called in our homes is a tasty side dish in South India for many snacks like Idli, Dosa, Rotti or even Uppit. It adds to the taste of whatever is eaten along with it. Its lip smacking for its khatta-meetha flavour. Here I will post the recipe for making 250 gms of Chutneypudi, enough to last for atleast a couple of months. Roast curry leaves till dry and crackling. Take care not to burn it. Keep aside in a plate to cool. Roast kadlebele along with half the red chillies till light brown. Pour it in a separate container to cool. Roast uddinbele along with half the red chillies till light brown. Pour it into the same container as kadlebele to cool. Roast the dry coconut till light brown. Take care not to burn it. Keep aside in the same plate as curry leaves to cool. Heat oil in the heavy bottomed vessel with the flame still low. To this add turmeric, mustard seeds, asafoetida and tamarind (stranded) and fry till the mustard seeds splutter. Now add the roasted dry coconut and curry leaves to the fried ingredients and mix well. Keep aside the entire mixture to cool. 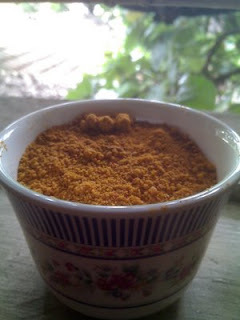 Once the kadlebele, uddinbele and red chillies are cooled, dry grind all the three to a coarse powder. Add the fried and cooled mixture to this and grind some more. Do not make the powder too smooth. Its nice to eat when a little coarse. Keep the chutney powder in an air tight container at all times. I love mixing this powder with sugar and eating it with dosa. You could try it too! T even eats this with rice with a little ghee to mix well. Loves it.